Singapore Airlines has devalued their reward chart effective March 23, 2017. This analysis reflects those changes. KrisFlyer is the reward program for Singapore Airlines and their subsidiary Silk Air. Singapore Airlines is a member of Star Alliance. With many options for accumulating points and the magnificent premium class service offered by Singapore Airlines, KrisFlyer rewards are a highly sought after way to fly. Levies surcharges on reward tickets. As of March 23, 2017 Singapore does not impose surcharges on own aircraft. Singapore Airlines' reward chart is based on Zones that are numbered 1-13. Singapore only departs from four North American cities; New York JFK, Houston, San Francisco and Los Angeles. You can also fly to other destinations connecting through Singapore with the only limitation that you can not back-track on a single ticket. * See Reward Search below for more conditions. Redemption totals to/from Zone 12 that connect through Singapore to/from Zone 4 or Zone 7, require the total of points from Zone 12 to Zone 1 plus points between Zone 1 and either Zone 4 or Zone 7. This is a significant difference. The website will show the direct route redemption value on rewards with a Singapore connection. But when you select it the price changes to the higher amount. Beware! See Reward Search below for more details. Note: There are no direct flights between Zone 12 (West Coast) and Taiwan or South China (other than SFO-HKG) in Zone 4. Note: Zone 13 East Coast to/from Zone 7(Japan/Korean) does not price out on Singapore's search engine. Not all Singapore aircraft have Premium Economy seating. Round trips require twice the points. The standard reward chart is did not change on the March 23, 2017 devalualtion. Silk Air reward tickets must use saver redemptions. Standard rewards offer two stopovers. You can use the website mileage calculator to determine required points for any journey, however you must be a KrisFlyer member to use this feature. You can use KrisFlyer points for any Star Alliance reward that may be available. The only restrictions are Swiss first class is not available and if you are booking an ANA domestic reward only, it can only be reserved between 2 months and 4 days prior to departure. The chart redemption values are for round trips. One-way is 50% of the points shown. This Star Alliance chart is effective December 7 2017. Singapore Airlines has also announced Star Alliance rewards will be available online. Star Alliance Round The World rewards are also available. Round the World travel must be in a continuous eastbound or westbound direction beginning and ending in the same country. Only one crossing of the Atlantic and Pacific ocean is allowed. Total distance in flight miles can not exceed 35,000. Seven stopovers are allowed with a maximum of 16 flight segments. You may only stop in a city one time and a country twice during the journey. Open jaws are allowed (Arriving in London departing from Paris) but count as a stopover. Singapore has 4 partners that you may redeem KrisFlyer points for flights. Redemptions from North America to London on Virgin Atlantic are more than Virgin Atlantic charges at 50K/65K/100K roundtrip and significant surcharges apply that typical exceed $1,000 for a roundtrip in premium class. A slightly competitive reward on this chart is Virgin Australia's Melbourne to Hong Kong route at 54,000 points one way. Otherwise it's pretty expensive. A recent partnership with Alaska Airlines allows reasonable Krisflyer redemptions. The west coast to Hawaii is only 12,000 points in economy class. However there is some confusion with this chart. It shows Zone 3 to Zone 4 which Alaska doesn't fly direct, only through Zone 1. So it doesn't make sense to @23,000 points in first while it's 34K to Zone 1 then 23K back to Zone 2. Also Zone 5, the east coast doesn't have a redemption to Hawaii or Alaska. On March 23, 2017 Singapore Airlines revised their commercial ticket pricing structure to remove fuel surcharges (YQ/YR fees), therefore these surcharges are no longer levied when redeeming reward tickets. Redemptions only require the typical airport taxes and fees. However KrisFlyer redemptions require cash payment of all carrier imposed YQ/YR surcharges on Star Alliance/Partner rewards. The best way to determine if a carrier has this fee is to build the itinerary you are looking at on ITA Matrix search engine. Click on the price tab and view the YQ/YR surcharges if any. Not all flights on other Star Alliance carriers have surcharges. No Show: $75.00 (plus point forfeiture if ticket is invalid, 12 months past original issue). You also my pay the redeposit fee or you will lose the points. Note: If you re-issue a ticket and the points required for the new ticket are less than the old ticket, the difference is not refunded. Krisflyer allows you to hold reservations before ticketing, potentially for a lengthy period of time. 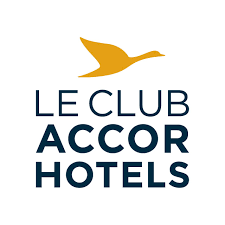 The qualification is you must have at least 50% of the required points to redeem the reservation in your account at the time of the hold request. You can not do this on the website, you must call to request a hold. Star Alliance rewards can not effectively be placed on hold. Reward tickets may only be issued to the account's main member or someone in the member's redemption group. This group can be a maximum 5 individuals where children are counted equally. Once a group has been nominated you must wait 6 months to make any changes and pay a service fee when changing online of $30 (or pay 3,000 points). If you change by fax the fee is $50 or 5,000 points. Elite members pay 50% of the fee. Any nominee in the group can make or change reward reservations in the account. Members are not allowed to share points, even within Redemption Groups. Krisflyer points expire 3 years from the initial date of deposit. The actual expiration date is the last day of the month, 3 years from the month they were deposited. (Deposit 6-12-2012, expire 6-30-2015). Points that have never been extended are eligible for a one-time 6 month extension for a small fee. Extending online - For every 10,000 points or portion thereof a $12 fee or 1,200 points is paid to extend. Extended by phone - For every 10,000 points or portion thereof a $20 fee or 2,000 points is paid to extend. Elite KrisFlyer members can choose to have their points extended for 6 months and all fees are waived, or extend for 12 months and pay these fees. Singapore Airlines has a single hub in Singapore. Other than the few 5th freedom routes they fly you will most likely travel to Singapore. Travel must be on a published route. Backtracking is not permitted unless applicable to a published route. An example is Hong Kong to San Francisco has a direct flight as well as a connection through Singapore which backtracks. However to fly through Singapore will be more expensive as it is priced for the extra distance, essential 2 redemptions. Your price is HKG-SIN plus SIN-SFO as opposed to the direct HKG-SFO route. However JFK to New Delhi will price as one reward even though it backtracks. Routes that are not allowed via backtracking can be obtained by getting 2 rewards. Contact Krisflyer to have them placed in the same PNR. Layovers up to 4 hours domestically and 24 hours internationally are allowed. Singapore Airlines allows for a single stopover on Saver round-trip rewards. No stopovers are allowed on one-way saver tickets, however for $100 you may add a stopover. On Standard rewards one stopover on one-way tickets and two stopovers on round-trip tickets are allowed. Open jaws are permitted when the ticket is redeemed for the highest amount. For example the SFO-HKG / SIN - LAX but you will pay the higher of two redemptions, therefore often it's better to simply book 2 one-way tickets. Layovers up to 4 hours domestically and 24 hours internationally are allowed. Anything over is considered a stopover. No stopovers are allowed on one-way tickets. One complimentary stopover is allowed on round-trip tickets, and you may add up to 3 additional stopovers for $100 each. No stopovers are allowed on domestic itineraries, or within the country where travel began. If travel is contained to within Europe or North America no stopovers are allowed. You may have open jaws, however if departure city and final return city are different, you can not transit through the original departure city. Searching for rewards on Singaporeair.com is straightforward. However you must be a KrisFlyer member to do so. Joining is free of charge at this time. You can join here. From the front page of the website simply enter your information. Make sure Redeem flights is checked for rewards and if you haven't logged in, you will be asked before results are shown. The search engine will return all possible routes if any Saver or Standard reward seat is available or Waitlisting is applicable for any reward. Highlight the reward you want by clicking on the radio button and a Booking summary will open at the top of the page showing the points total as well as all taxes and fees. An issue I've encountered is when all segments for an itinerary show reward availability individually, but when you search as a single route it shows as Waitlisted. Apparently this can be common after speaking to an agent. So it is recommended to search the segments individually if your complete itinerary search comes up empty. To ticket it simply contact KrisFlyer. Zone 13 (East Coast & Houston) to Zone 7 highlighted by red box does not price out on search engine. Reward charts are based on a specific booking class as is the search engine. When you search for a reward you select the class of service. If your itinerary includes segments where the class of service you are requesting is not applicable, your search result will be for the next lower class of service flown on all segments. For example if you want premium economy class from Los Angeles to Bangkok, while the route from LA to Singapore has a premium economy cabin, no flights to Bangkok have a premium economy cabin. Therefore the search engine will return an economy class itinerary for the complete trip. To book the LA to Singapore route in premium economy you must call. The policy for Singapore and Star Alliance redemptions is you will be charged the higher class redemption value. You can ask the agent to adjust the portion of the trip that doesn't have the desired class for Singapore flights. (Typically it is a minor adjustment and dependent on the length of the lower class flight.) This issue often happens with first class redemptions because to many Asia destinations Singapore Airlines does not fly aircraft with first class cabins, i.e. Bangkok, Taiwan, etc. Don't expect to get a reduced fare for these short connections. KrisFlyer allows waitlisting for Singapore Airline flights only. Waitlisting on a flight will give you an opportunity to redeem points in the event reward inventory is released for that flight. If a flight you want shows waitlist and you place your name on the waitlist, you will be assigned a booking code. To waitlist a flight you must have points in your account. Rules state the full number of points are necessary, however there may be cases where you can waitlist with fewer by calling. If reward inventory becomes available for your waitlisted flight you will be contacted by text or email and given the opportunity to secure the reward. (Anecdotal internet stories claim on rare occasions this doesn't happen so it might be a good idea to check every so often.) Once you are notified you have 24 hours to ticket the reward otherwise your reservation is cancelled. Therefore if you are transferring points you most likely need to have them in place when the inventory opens. You may take a lower class reward and waitlist for the other class without cost. Simply either ticket the one reward and waitlist the other, or ticket the reward and call to waitlist the other. In addition, if your ideal date is not available but another date near to it is, you may book the one date and waitlist the other. You are also allowed to waitlist multiple rewards. Waitlisting must be open for the flight and class you are interested in. Also sometimes waitlisting is open for a standard award and not a saver award. You can not waitlist unless the website shows availability. Overall I've found Singapore KrisFlyer phone agents to be very accommodating and easy to deal with. Singapore Airlines First Class Suite on the Airbus 380. Dozens of reviews on the internet praise this experience. And for a Sweet Spot in the reward chart it's not over the top expensive compared to other first class redemptions. Unfortunately in October 2016 Singapore is removing one of two A380's that fly to North America, leaving only a JFK departure. If you just want to fly Singapore first class, which is great on its own, you can try the 777 out of the west coast to Tokyo, Seoul or Hong Kong. The DIRECT SFO- HKG route is 92,000 versus 110,000 AA points on Cathay Pacific. Or the DIRECT LAX-Tokyo/ICN flight is 95,000 versus 110K UA points on ANA. Business class is also competitive. From SFO you can fly direct to Singapore for only 88,000 points and this non-stop route is flown on their new A350 with the new business class product. Previously the KrisFlyer Star Alliance reward chart stacked up well against United's chart. However now that both have devalued in late 2017 the advantage for Krisflyer is limited to Hawaii redemptions on United or Air Canada. You can also get some savings in US domestic premium cabins. The best reward is to Hawaii where you will save 10,000 points in economy and 20,000 in premium cabins. KrisFlyer collects surcharges, but United domestic flights to Hawaii do not have surcharges. Otherwise to Europe it's mostly equal, with the exception of first class on Lufthansa to Europe. You can save 30,000 points round-trip however the LH surcharges amount to close to $1,000 for this journey, negating the advantage. Krisflyers new Star Alliance redemptions to Asia became very expensive. KrisFlyer allows upgrades on both Singapore / Silk Air flights as well as Star Alliance flights. Only single class upgrades are allowed. The March 2017 devaluation removed the 15% discount but the redemption values stayed the same, effectively increasing the upgrade by 15%. Not all Singapore aircraft have premium economy so it's important to check if you're looking to upgrade. This chart shows upgrade redemptions from North America. These are one way upgrades. Again, be mindful the the Zone 4 and Zone 7 amounts as these are direct flights. For a complete list of Singapore upgrades click here. Are upgrades worth it? Or should you simply get the full reward ticket? Or should you pay cash? This all depends on what the fare is at the time you are looking. Low fares can be great deals. 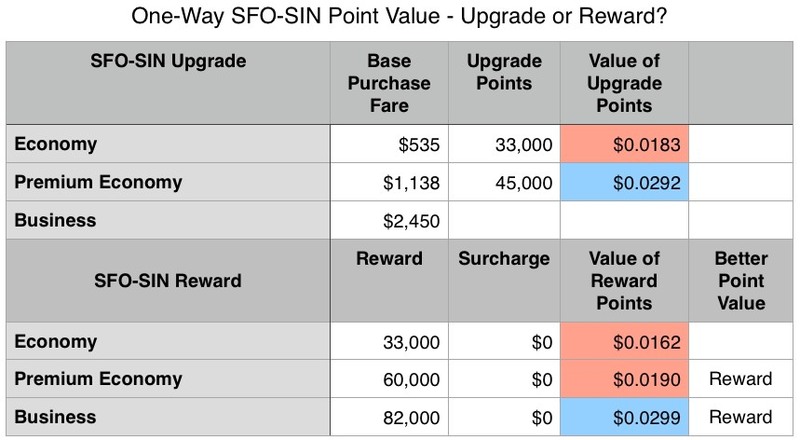 These are two examples comparing upgrades and rewards to purchasing the ticket outright. The fares checked were 2 months out and were fares that could be refunded for a penalty. Economy was $500, Premium Economy was $692, Business $1,400 and First $5,300. The calculation returns a value for the points. To upgrade from Economy to Premium economy the difference in fares ($692-$500=$192) is divided by the points required to upgrade. $192 / 15,000 = .0128 cents is the value received for each point. This calculation is the same except the dollar basis is the Purchase Fare plus any surcharges (Taxes and fees are not included). Better point value simply compares the value of points for the specific class. However any outright reward that has a 3 cents or better redemption value will show that the reward is a better option over the upgrade. SFO-SIN - This is the non-stop on the A350 that doesn't have a first class cabin. This feature allows you to pay for part of your fare with points. A minimum 2,940 points is required. The value I received for 2,940 points when testing this was $21.57, or .0075 cents per point. (But they allow you to buy points at 4 cents!, so buyer beware.) For more information click here. Singapore Airlines accumulates points based on the mileage system with an adjustment based on booking class. You can also earn KrisFlyer points when flying any Star Alliance or Partner (Virgin group and Vistara) carrier. Simply attach your KrisFlyer account number to the reservation and receive points based on this chart. All Co-brand credit cards are Asian based. Singapore has excellent transfer partners making this program one of the easiest to accumulate points without flying. Singapore Air's shopping portal is called KrisFlyer Spree. It is an international site and has a good amount of US based retail stores where you can earn points. Looking to rent temporary office space from Regus? You can earn up to 10,000 KrisFlyer points. For a complete list of ways to earn KrisFlyer points go to Singapore's website. You may purchase up to 50% of the Singapore KrisFlyer points needed for a reward. The purchase price is 4 cents per point and must be purchased in blocks of 1,000. There are other ways to purchase KrisFlyer points for much less. Krisflyer is an excellent program. If you are looking for the top of the line premium reward flying experience look no further. Redemptions are competitive compared to most other top tier airlines and reward inventory is typically generous. But the best part of Singapore's program is you can get points with the four major credit card programs that allow point transfers, making this one of the few programs you can do that with.